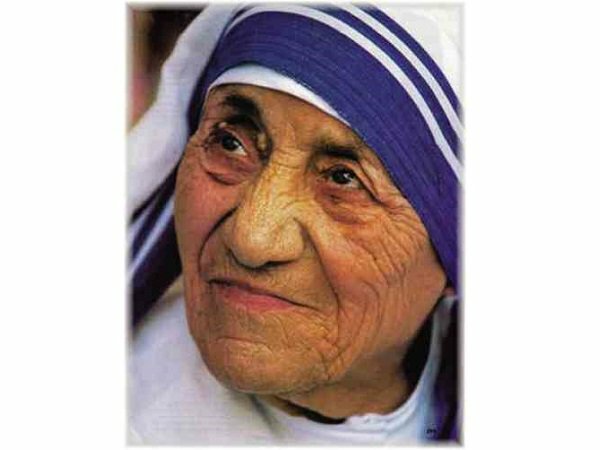 Homilies and Occasional Thoughts: St. Teresa of Calcutta: What is her call to you? St. Teresa of Calcutta: What is her call to you? Well, that problem is certainly solved! We pray to saints, not for them. St. Teresa of Calcutta is one of two saints to have visited our city. Along with St. John Paul II, she blessed Vancouver by her presence and by her words. And her canonization this morning by Pope Francis makes official what we already knew: her life and mission were a blessing to the whole Church, a blessing that will continue to be fruitful from now until eternity. “Then you take it!” she said decisively. However, I was wrong in thinking that these Sunday readings can’t help us ponder the canonization—or that the canonization can’t open our hearts to the message of today’s Scriptures. Because Pope Francis did just that in his homily this morning at St. Peter’s Square, with our own Father Paul joyfully in attendance. That sounds like a very tough question, but “we find the answer in the same passage of the Book of Wisdom [where it says] ‘People were taught what pleases you’ (Wis 9:18).” In order to know what God wants us to do, we need to understand what pleases Him. Fortunately, the Bible tells us what is pleasing to God in countless places. Pope Francis sums up one key message in the words “I want mercy, not sacrifice,” which we find in the book of the prophet Hosea and on the lips of Jesus in the Gospel of Matthew (Hos 6:6; Mt 9:13). We all know very well that “God is pleased by every act of mercy,” because Jesus himself told us that when we help our brothers and sisters, we help Jesus himself (cf. Mt 25:40). The Holy Father called Mother Teresa “a generous dispenser of divine mercy,” in all aspects of her life. He called us to make her our model of holiness and of volunteer service. This takes me to the key point of my homily this morning: what does this mean to us, nearly 12,000 kilometers from Calcutta? We have no lepers in our streets, nor people dying with medical care—so how do we respond to the example of the new saint? In his homily, Pope Francis states clearly that every one of us is called to translate our faith and prayer into concrete acts. “There is no alternative to charity,” he said. The canonization of the so-called “saint of the slums” or “apostle of love” is certainly an occasion to celebrate the tremendous concern for the needy that many of our parishioners show by their work with and support for the Society of St. Vincent de Paul. With tireless charity, they feed the poor in a neighborhood that knows a poverty almost worse than in Calcutta, because it is rooted in something worse than material need. Just yesterday, our SVDP volunteers set out at six in the morning to organize the monthly breakfast they serve at The Door is Open, the archdiocesan drop-in center on Cordova Street. On September 17, they’ll prepare and serve a lunch there, and in between provide emergency lunchboxes distributed on Main Street. Other parishioners informally organize a street meal for youth and others, served in the lobby of an office building downtown. It almost goes without saying that the members of our parish family who have reached out to refugees have responded as Mother Teresa would have done. Some of us will be called to mercy in our own homes—we will find Christ in the distressing disguise of troubled or ungrateful family members. Some of us find in St. Teresa a call to a greater effort in defense of the unborn, of the elderly, and of the vulnerable. People are not dying in the gutters of our city. But death in a hospital with no-one showing they love you is not much better. As the attack on the elderly and depressed through legalized suicide unfolds, more of us may need to become Mother Teresas in care homes and hospital wards. No-one should be afraid of the challenge our new saint gives us, because we already know what pleases God, and we have the Holy Spirit’s gift of wisdom to help us translate it into specific actions in our own lives. It was a clever request, because it was easy to remember. But it was also profound, because the moment when the priest puts a drop of water into the chalice is a reminder of our weak humanity sharing in the divinity of Christ. Our call to mercy is a call to do what Jesus did—not alone, but with his strength and grace. 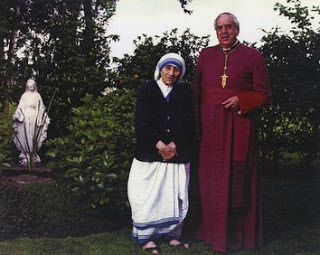 The top photo shows Mother Teresa with the late Archbishop James Carney during her 1988 visit, during which she opened the house of her Missionaries of Charity at his invitation.